This is especially the case for companies involving computers, workstations, and laptops. Security’s big these days. Why not help out employees some by ensuring their private information — and your sensitive corporate info — remain protected? Makes sense. Simply stock up on these babies and offer one each to each employee. You can even personalize them, owning up to the fact that each employee deserves privacy and protection at his/her desk. This provides ownership to the employee. They’re in charge of their work space. They have a dedicated USB lock designed to protect their work from anyone — hackers, malicious spyware, you name it. Sure, they make great gifts. But they can easily make better branded materials for your entire business. You see, the point of a USB lock is that you have a simple flash drive. Only it’s not just a flash drive. It’s basically a key. The key is designed to lock whatever device you’ve inserted the drive into. Once inserted, you’re the only one that can get into your computer/laptop/tablet/phone. Once you remove it, though, the device is locked. No one can take another flash drive, stick it into your device, and steal any information — or even view the information! The technology’s relatively new but sweeping the nation, particularly with IT and other computer-related industries. Leverage this. Own it. Brand it. Make it your own. Believe us: your employees will be impressed that you have this in place. It’s secure. It’s safe. And the best part? It’s branded. Go for it. Contact us right now. 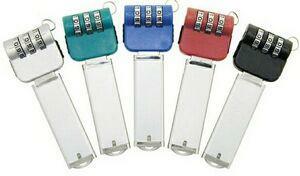 You can also peruse the many designs we have on locks for even more ideas. Whatever the case may be, one thing’s for sure: no one’s going to get the jump on you!